Did you know MCD tracks precipitation, groundwater levels, and flow in rivers and streams? This information helps MCD and its partner agencies with flood forecasting, groundwater quantity monitoring, and understanding water movement into and out of the Great Miami River Watershed. Here’s what we tracked in 2016 and what we’ve seen in 2017. Precipitation for the year was right around 37 inches or about 2.5 trillion gallons of water. 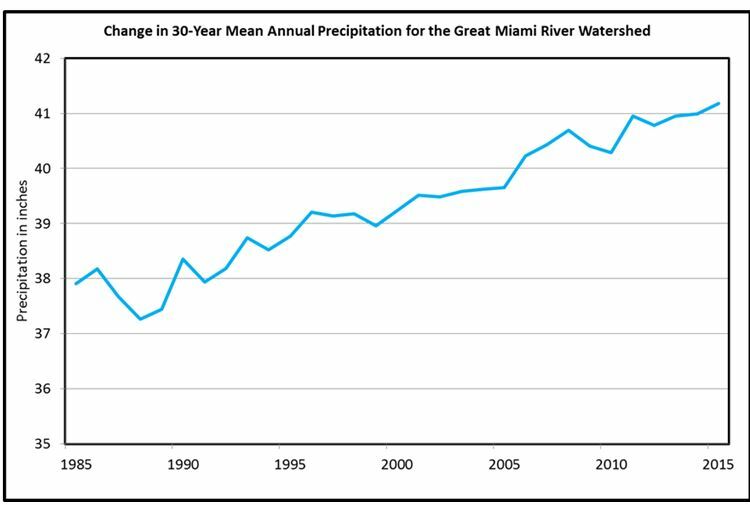 Average annual precipitation for the Miami Valley is about 43 inches. 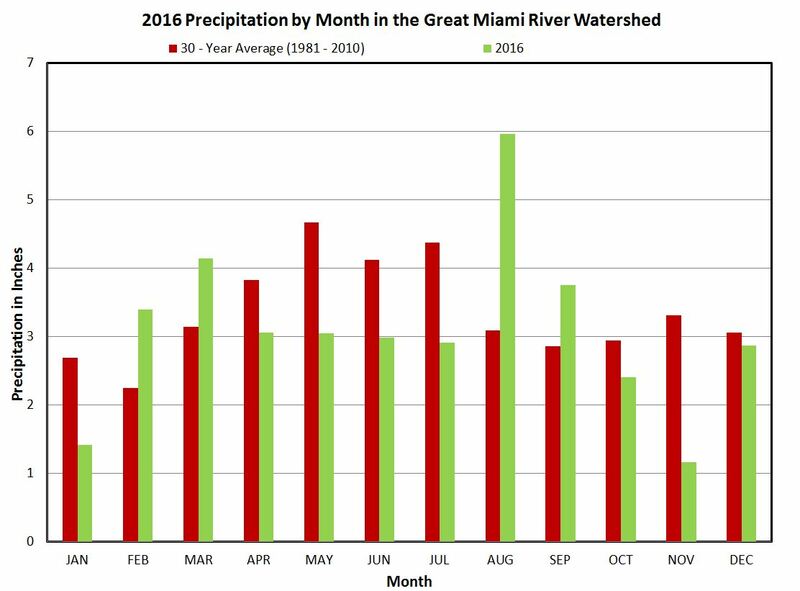 Precipitation was below average eight of 12 months in 2016. August was a notable exception with nearly 6 inches of rain. The average for that month is a little more than 3 inches. Runoff from the Great Miami River Watershed into the Ohio River was about 12 inches or 823 billion gallons of water. Runoff includes water from rainfall and groundwater water that seeps into the river. Average annual runoff is about 15 inches. Water levels in the buried valley aquifer began the year near average at most observation wells. They declined to below-average levels during the summer and then returned to average levels in the fall. Water recharge to Miami Valley aquifers averaged a little more than 6 inches or about 411 billion gallons. Average annual recharge for the watershed is around 8 inches. Despite the lower average for 2016, the region has an abundance of groundwater. What are we seeing in 2017? We’re not even halfway through the year, and precipitation and runoff are trending above average. At the end of May, MCD had recorded nine high water events this year, which is above average for the entire year. MCD recorded only five high water events during all of 2016. Any single dam goes into storage, meaning the elevation of the water upstream of the dam exceeds the top of the dam’s conduit. Or the river at any of our cities reaches an “action stage” as defined by the MCD Emergency Action Plan, such as closing a floodgate. According to the National Oceanic and Atmospheric Administration’s Ohio River Forecast Center, there’s an equal chance of above- or below-average precipitation for the next three months. Beyond that, it’s anyone’s guess.